I have been thinking a lot lately about quantum mechanics and how i can use animation to explain how this stuff works within my LifeOS model. The other day i ran across this video series which does just that, up to a point. It does a really good job of illustrating the basics, with good quotes and descriptions from some of the best thinkers on the subject. If you are not up to speed on quantum/holographic/field model of the Universe, especially the double slit experiment, (in the first half) check out the above video. Or dive right into my explanation. Naturally we want to look at this from a systems viewpoint. We may think we can isolate a particle to see how it behaves, but it is always part of a larger system. There are two things you must know to have this experiment make perfect sense. First, the wave function represents the particle’s connection to the larger holographic system. It is in holographic synchronization with that system. Secondly, that system is pure quantum information processing that uses particles as dynamic memory units(Qbits). When a single particle is fired at the double slit, it’s internal wave function keeps it functioning as a memory unit in the larger system, in phase as if accompanied by a flood of particles. This is known as quatum entanglement. So the wave the particle is following is from it’s internal movement and not it’s trip through the slits. When it is observed it changes from a memory to input mode, collapsing it’s connection as a bit of memory and inputs the system with the details of it’s interaction with a sensing device. For us to understand how observation can affect a particle we just have to look at the next higher order of the system process. We are used to thinking of observation as a one way street: light bounces off something, is collected by our optical gear and projected in our brain. In the systems view we look at how observation works for an environment teeming with mobile creatures. At this level observation is part of a dynamic interactive process that involves the environment and all of our senses. We move through the environment, touching, disturbing, picking, eating, constantly observing our actions and their effect on the environment. The environment is made up of a variety of sensing devices feeding into the same system. To observe is to interact. Another way to state this is that particles are not only objects, but bits of memory, that contain reports on the status of their particiation in the larger process. Although a particle may seem to exist as a solid thing, it is fully involved in a process. That process is the wave action of a vibrational universe. It is inherent in the particle by way of quantum entanglement. To mess with that status reporting particle is to kick it out of the process. It can then shoot through one slit as an independent particle, reporting back to the system it’s new trajectory. The other amazing anomaly the materialistic view of matter gives us is that particles pop in and out of existence. This flashing in and out of material existence is the fundamental oscillation of the process. That is comparing the internal with the external. It is the cycle of the Qbit checking it’s internal memory against the external. It is changing back and forth from pure information to matter, as it’s status is updated. I’m working on some animations, but would love to hear some feedback from you folks. I know some of you are quite knowledgeable on this subject. My sweetheart and i like to do jigsaw puzzles. Putting one together is satisfying on several levels. We have fun. I get an extra kick out of seeing the pieces as packets of information, also on different levels. The shape of the pieces is information that determines how they fit with their immediate neighbors. On each piece you have bits of information as brush strokes, lines, shapes and color, that also needs to match its neighbors. This is a separate level of information from the shapes of the pieces themselves. Both of these levels pertain to the assembly of the puzzle. When the puzzle is solved, the assembled bits produce a new level of information: the picture. The picture, in turn can produce another level of information by telling a story. 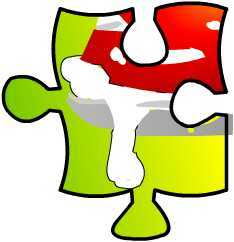 In the jigsaw puzzle we have levels of information woven together to support a system of encrypted data storage. Atoms are packets of information limited to their connections by their shape. They also carry another level of information in their charges, spins and wave function, variables separate from the molecular shape. These internal variables are connected to externals through the laws of quantum mechanics. It looks to me like data storage with relational links, like a database. There are infinite levels of information woven into biological systems, each one representing a web of quantum connectivity with its own level of functionality, the levels immediately above and below, and to all levels ever interacted with. It is a living breathing hyper-relational database that acts like it is a super quantum computer solving for the most efficient growth, reproduction and dispersal through adaptation. The terms uncertainty and probability are mathematical concepts that do not refer to anything physical. Uncertainty is a condition of the mind. Whether the cat is alive or dead is only an uncertainty to the mind of an observer outside the box. To the cat and its fleas, there is no uncertainty. Probability is statistical, inferring the comparison of many events over time. Time is another mental concept involving a memory and something like an imagination that can plot a path into the future. If it is true that Quantum Mechanics, “is the mathematical description of the motion and interaction of subatomic particles,” and involves these same nonphysical, but decidedly mental concepts, how can we deny that QM is the very essence of intelligence? When we say, “That’s probably true,” or “I think so,” we are exercising our ability to imagine the future. How is it that subatomic particles are engaged in the same kind of behavior? If subatomic particles are somehow connected to future events, it must be through some nonphysical process that remembers, evaluates and acts, very much like our own consciousness. The process is most certainly nonlinear, non-local, fully coherent and interconnected. The model becomes clear when we view the Universe, not as an explosion, but a computation. The Big Bang becomes the Big Bootup, with no need to suspend classical physics for it to happen. There is no paradox between quantum mechanics and classical physics if you consider one is the process and the other is the output. In the information processing model, the output of the quantum process is the physical Universe. The physical Universe is the expression of the current state of the process. The overlapping, nested and holistically interconnected quantum coherent fields represented by wavefunction, are the process in action. In this model it makes perfect sense that subatomic particles represent non-local variables, and could be collapsed by local interference.